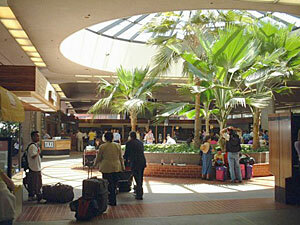 The Kahului Airport (OGG) is situated on a land bridge between the West Maui Mountain Range and Haleakala. Approximately three miles separates the town of Kahului from the airport. The only other commercial airport on Maui is (JHM). The JHM airport is generally used for inter-island flights. The airport offers inter-island commercial flights and overseas domestic service. Kahului Airport is composed of two main runways and also is host to a permanent helicopter pad. OGG Airport provides commuter/air taxi and general aviation operations, including helicopter operations. Automotive access is provided via a roadway network that connects to the Hana and/or Haleakala Highways. 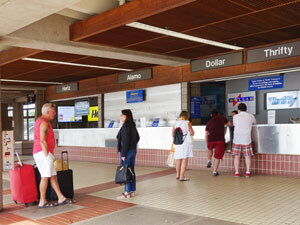 After exiting your plane in Maui you will enter the passenger terminal (mostly open-air) of the Kahului airport. 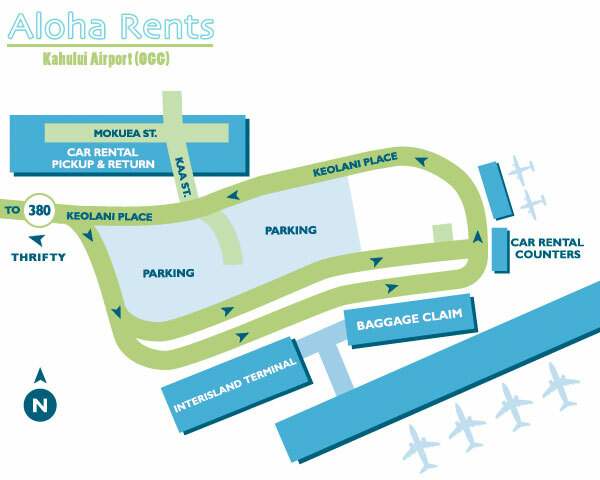 Claim your baggage and proceed to the car rental company booths located out the main entrance and to your right. Since you already have your discount reservation, follow the sidewalk around back to find the Maui car rental shuttles. Locate the sign with your specific rental car company on it. The shuttle literally runs every 3-5 minutes, so you never need to wait more than a few minutes. If the booths are closed (many of them often are) when you arrive, you can simply go around the back of the booths and hop on your company's shuttle. You will complete your paperwork after exiting the shuttle at the car rental lot. The majority of the lots are all within a 3-4 block range of the OGG airport. Remember long term Maui rental cars are available for multi-month vacations or for an exteneded job contract in the islands. The shuttle bus ride only takes about 4 minutes. No worries! Visit our Maui rates page or get a rental car reservation now.